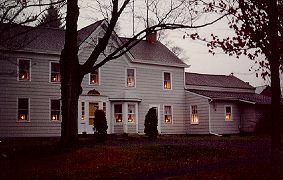 If you are looking for a traditonal bed and breakfast, come to the Milton Bull House. This historic home has nine large rooms furnished with antiques. 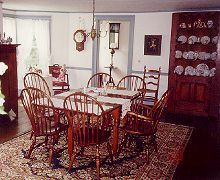 A section of the house dates to the 1830's and the rest is even older. Our two guest rooms are large, airy and share a full bath. The house is located in a lovely area of the Hudson Valley, in the foothills of the Shawangunk Mountain Ridge which provides wonderful scenery as well as opportunities for hiking and rock climbing. Shopping malls, such as the Galleria in Middletown, marts and wineries are nearby. Although the area is rural, we are very close to Route 17, the N.Y.State Thruway and I-84. The house is surrounded by lawns, gardens and orchards. An inground pool is available to our guests. Our rates include an old-fashioned farm breakfast with homebaking. We accept MC/VISA. The Milton Bull House is in the Town of Crawford, in northwestern Orange Country, one of the most beautiful counties in the Hudson Valley of New York State. A scenic highway runs past our front door! New York City and West Point are located seventy-five miles and forty-five miles respectively to the south. This and other Pine Bush Bed and Breakfast Inns can be found here in The Register.